WARNING: The following images are not for the faint of heart or squeamish. Anyone who has followed my 'legacy' blog over the years, would be more than aware that I have complete tolerance for the various cultures and rituals that are followed in different countries... no matter how bizarre they may seem by western standards. I guess this tolerance has come about predominately as a result of the many years I have spent living abroad in Asia and the customs I have personally witnessed. One of the more intriguing celebrations, is the 'Phuket Vegetarian Festival' held each year in Phuket, Thailand. 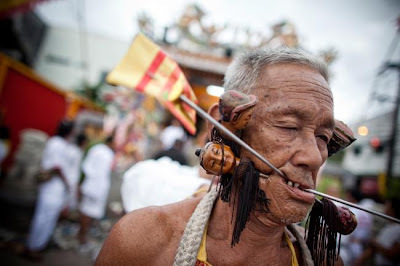 According to the festival's website, the Phuket Vegetarian Festival is "A colourful event held over a nine day period in late September/early October, this celebrates the Chinese community's belief that abstinence from meat and various stimulants during the ninth lunar month of the Chinese calendar will help them obtain good health and peace of mind." It is believed that 'Ritual Vegetarianism' in Phuket traces it roots back to the early 1800's. 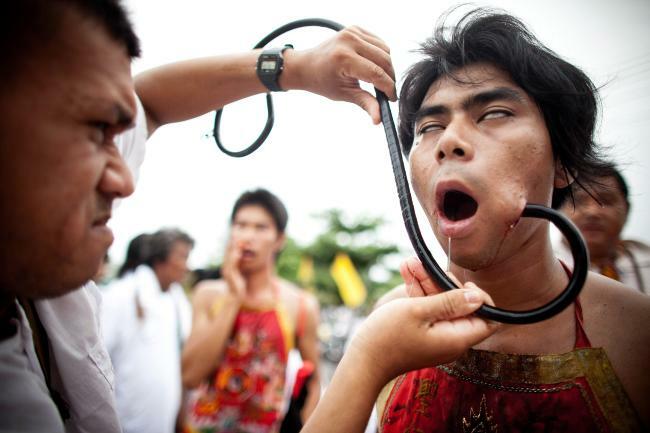 Probably the most bizarre aspect of the festival is the ceremonies which are held to invoke the gods. 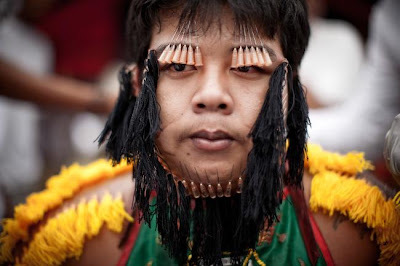 These include, "firewalking, body piercing and other acts of self mortification undertaken by participants acting as mediums of the gods... Men and women puncture their cheeks with various items including knives, skewers and other household items. It is believed that the Chinese gods will protect such persons from harm, and little blood or scarring results from such mutilation acts." Oh man, are these images real???? 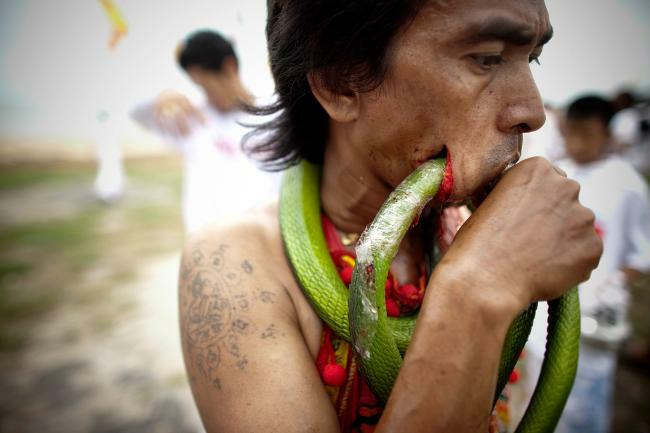 The one with what looks like a green snake through the face, and another with knives through his face looks so unbelievable!!! !